10. Finding a book I’d like to read, going on GR to add it to my TBR list and then staying too long reading reviews. I’ve stumbled upon spoilers too many times so MUST. STOP. BROWSING. 8. Eloquently expressing what didn’t work for me in a book rather than shrugging with “Eh, it was okaaay“. 7. When to give up on a book. There are a few award winners that I’ve tried to read more than once at different times in my life and just couldn’t get into them. What’s wrong with me?! 6. Finding nonfiction that I will stick with that aren’t memoirs. 5. Getting over a reading slump. 4. Wanting ALL the bookish things. Here’s a start. 3. Culling shelves. Physical and on my Goodreads TBR list. 2. Realizing I will probably never finish my TBR list of books. It’s not a full realization yet but getting there. Slowly. 1. Finding more time to read. 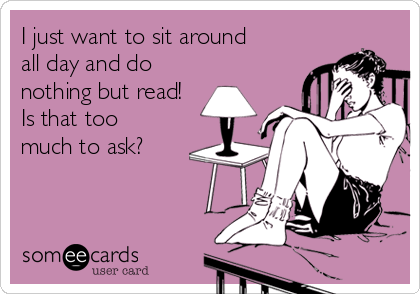 Have any bookish problems you’d like to share? Original meme hosted by The Broke and the Bookish. Tags: Bookish Problems, top ten tuesday. Bookmark the permalink. I agree with 100% of these! Sometimes I just want to get rid of all the books I haven’t read yet and start fresh… but who am I kidding? I can’t do that! I’ve been deleting some of my TBR on GR. Only the ones I own or know that I want to read no matter what. It OK to not finish a book. Really. 50 pages – I know some will disagree, but sadly, we won’t get to the end of the TBR. Sigh. Haha! I am sure all book bloggers have started their blog for the same reason.